A trip to Tan-Tar-A Resort was not quite a vacation for eight University of Missouri–St. Louis vocal music students chosen to perform with the 2019 All-Collegiate Choir Jan. 25 at the Missouri Music Educators Association’s annual In-Service Workshop/Conference in Osage Beach, Missouri. They crammed seven rehearsals into fewer than three days with other top singers from colleges and universities across the state, all in the cause of being ready to perform before an audience of more than 800 on the conference’s final night on Jan. 25. Jim Henry, associate professor of music and director of choral studies, hand-selected eight students – sopranos Alayna Epps and Lexi Neal, altos Loban and Theresa Pancella, tenors Swabu Jefferson and Keegan Eich, baritone Graham Haven and bass Nick Bashaw – for the honor of performing with the all-collegiate choir. They make 24 UMSL students who’ve been selected for the all-collegiate choir – which is named once every three years – since 2006. “It’s a great opportunity for our students to network and meet other music students from around the state,” Henry said. “College choirs tend to be a bit insulated, but once the students graduate college and get out into the world of teaching or performing, they’re going to run into all these people. 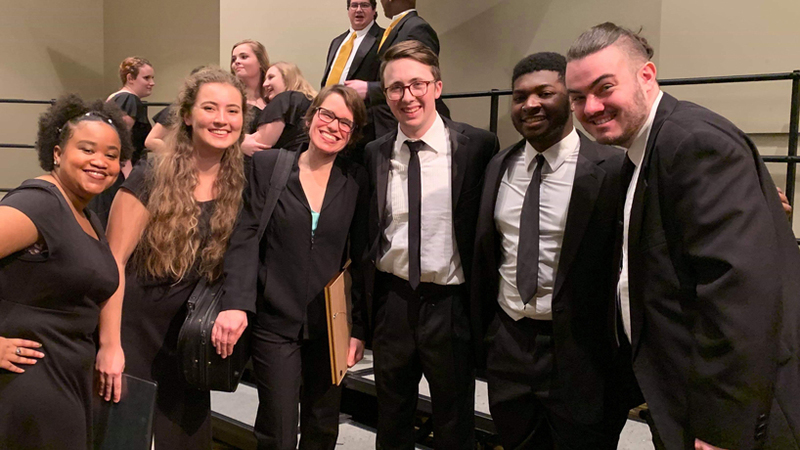 For most of UMSL’s 2019 All-Collegiate Choir students, it was not the first time they’d sung at the MMEA conference. Several had been chosen for all-state choir as high school students, and most had been part of University Singers when the whole group received an invitation to perform at the 2018 conference. She was honored and eager to return to Lake of the Ozarks with her fellow UMSL students. 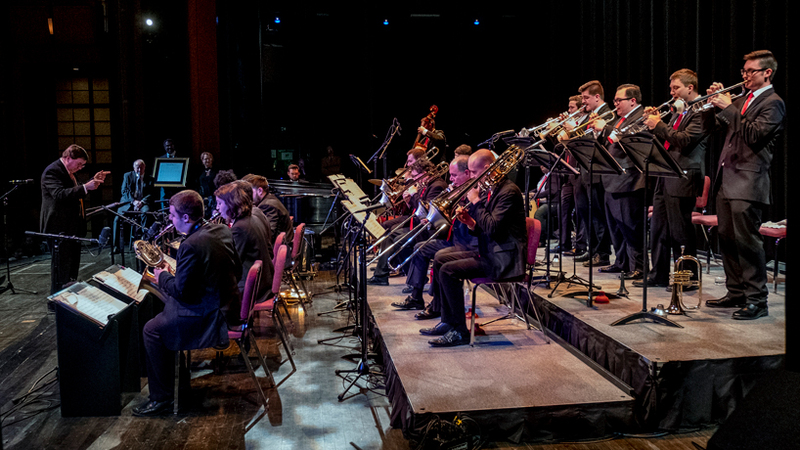 They had a chance to reconnect with some familiar faces – including former music teachers – and attend some of the conference’s many workshops. But their main priority was getting ready for their performance. They were given the repertoire in December and learned it over the winter break. Eich, majoring in music theory and composition, was one of several students who said he began his preparation on YouTube, studying other college or professional choirs who’d performed the songs before. The UMSL students also had one rehearsal together on campus. Of the eight songs they performed, several of the students were particularly taken with “Idumea,” a shape-note song from the Sacred Harp book. They worked with conductor Eliza Rubenstein, a Missouri native now part of music faculty at Orange Coast College in Costa Mesa, California. 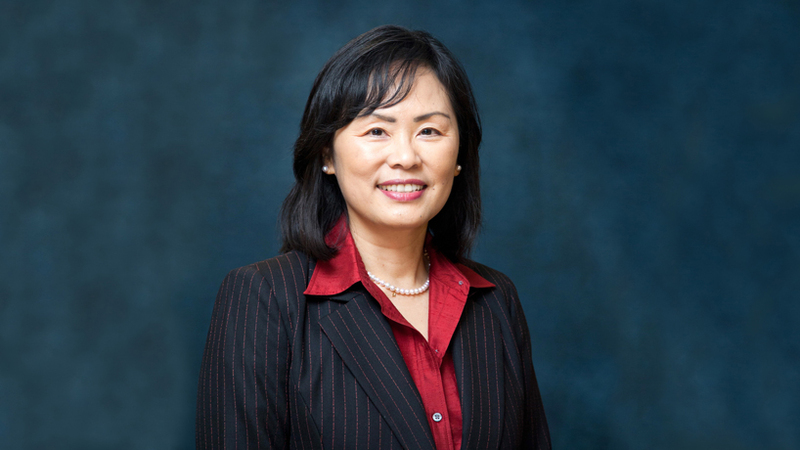 She also serves as the artistic director of the Orange County Women’s Chorus and the Long Beach Chorale and Chamber Orchestra and a music director at Mesa Verde United Methodist Church.